Gershon Ben Keren teaches Krav Maga as a form of self-protection in Boston, Massachusetts. He received his Krav Maga teaching certification, and the 5th Degree Black Belt he currently holds, in Israel, where this powerful form of self-defense was developed. In 2010 he was inducted into the Museum of Israeli Martial Arts. He wrote this book as a means of teaching others self-defense employing the same techniques used by the Israeli military. What Makes Krav Maga: Real World Solutions to Real World Violence a Good Buy? Krav Maga is not your typical self-defense, self-protection form. It focuses on real world situations, and combines aikido, judo, boxing and wrestling. It teaches “regular Joes” close combat, street fighting skills that are so effective they are used by the Israel Defense Forces (IDF). The emphasis is on neutralizing a threat, while simultaneously attacking and defending yourself. The high level of force this self-defense practice is based on means a no-holds-barred approach to protecting yourself from an attacker, and is taught in this book by a globally recognized teacher. 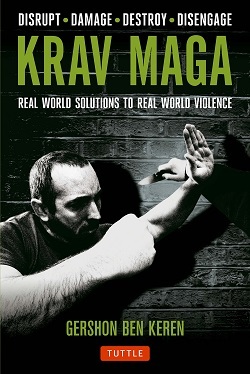 The subtitle, “Real World Solutions to Real-World Violence”, encapsulates what Krav Maga is all about. Step-by-step instructions with easy-to-follow photographs display typical situations you may find yourself in while you move through your normal routine. This means that everyday men and women can learn how to disable an attacker, even when the attack comes from a much larger person. Hiring the author, Gershon Ben Keren, to give personal instructions in this effective self-defense practice would be beyond the financial capability of most people. However, in in this book you receive the same instruction Ben Keren gives to private clients, security forms and military forces. You learn The Timeline of Violence, which helps you understand beforehand when and how a personal attack will take place, and how it can escalate. You will also discover proper stances, blocking, striking and movement for different self-defense maneuvers. Other topics include defending knees, basic safety skills, disarming knives and guns, and lessons in defending against abductions and hostage taking situations. If you feel you need more control over how protected and safe you and your family feel, consider picking up this book. Both paperback and Amazon Kindle versions are affordable investments that can help secure the safety of you and your loved ones in a personal confrontation or attack.